In Missouri, when people say they’re “Going to the lake,” they’re usually referring to Lake of the Ozarks. This famed body of water is unquestionably one of the true gems of the Show-Me State, and is a great example of fine multi-species fishing. The water here is one of Missouri’s biggest family vacation destinations, and is a summertime party hot spot, but we’ll explore its hot year-round fishing opportunities. The bass fishing here rates high for both the numbers and size of fish. 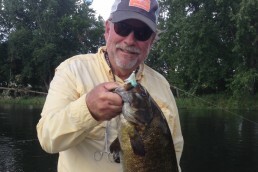 Largemouths make up the majority of the catch for our team guides in most areas, but spotted bass are also abundant. When fish are active it’s hard to beat a big spinnerbait, but cranks and topwaters also take bass when fished quickly to trigger reaction strikes. When the action slows down, bass in a neutral or negative feeding mode will respond better to jigs as well as Texas- and Carolina-rigged soft plastics with bulky craw tubes and freak baits. Look to cover for the lake’s big bass, as docks, laydowns, stumps and rocks will hold these fish. The best spots have a shallow-water shelf or flat or a gradually tapering shoreline with a sharp drop-off in deeper water nearby. Crappies and bluegills are another big draw for anglers. The lake produces numbers of good-sized crappies, and the big bluegills will hold the interest of young children and experienced anglers alike. One of the most preferred methods is to rig a small panfish tube on a 1/32- to 1/8-ounce tube jig. This bait is usually suspended under a small float. The rig is slowly dragged over and along rocky banks, flats and points with wood cover. Linesides are another big draw. The lake has populations of stripers and white bass to provide feverish action. It’s not uncommon to catch hundreds of these beautiful, hard-fighting bruisers in a day. Often, when we get on top of some big schools of these pelagic fish, we’ll catch one on every cast and sometimes dozens of times in a row. One cast may produce a scrappy white bass while the next cast can yield a big striper. Also, the largemouths, spots, walleyes and other species will mix in with the temperate bass species and feed with them. At times it’s almost like saltwater fishing, as you never really know what you’ll catch next. Lake of the Ozarks also holds the Missouri state-record hybrid striper that weighed in at over 20 pounds. Stripers and whites can be taken on a variety of presentations. These fish roam around the lake a lot and feed almost exclusively on baitfish, so lure choices should revolve around baitfish imitations. Spinners, spoons, jigs and blade baits all take lots of fish. 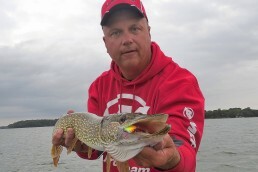 Crankbaits, minnow baits and surface lures have times when they excel at taking these too. Catfishing is one of this lake’s oldest pastimes, and this water is truly a world-class cat fishery with blue cats, flatheads and channels of enormous proportions and numbers. Snagging for spoonbill during the season is another big draw. 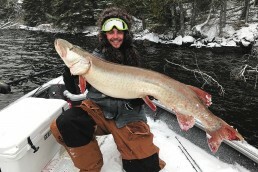 The lake has coughed up the state-record muskie too, at over 41 pounds, the state-record drum that was over 40 pounds and some pig walleyes over 30 inches. 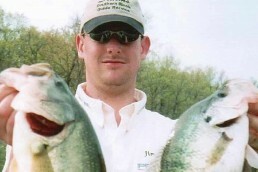 Colby Simms is a professional fisherman, media personality, guide and owner of Colby Simms Outdoors Group. He runs a guide service booking guided fishing and hunting trips, and sells tackle. Contact him at colbysimmsoutdoors@hotmail.com, Facebook @ColbySimmsOutdoors and @ColbySimmsSportFishingPro, or 618-521-0526 or 573-358-5948.